Paradoxes and paper-folding, Moebius variations and mnemonics, fallacies, magic squares, topological curiosities, parlor tricks, and games ancient and modern, from Polyominoes, Nim, Hex, and the Tower of Hanoi to four-dimensional ticktacktoe. These mathematical recreations, clearly and cleverly presented by Martin Gardner, delight and perplex while demonstrating principles of logic, probability, geometry, and other fields of mathematics. 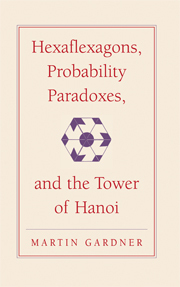 Hexaflexagons, Probability Paradoxes, and the Tower of Hanoi is the inaugural volume in Martin Gardner's New Mathematical Library. This book of the earliest of Gardner's enormously popular Scientific American columns and puzzles continues to challenge and fascinate readers. Now the author, in consultation with experts, has added updates to all the chapters, including new game variations, mathematical proofs, and other developments and discoveries.